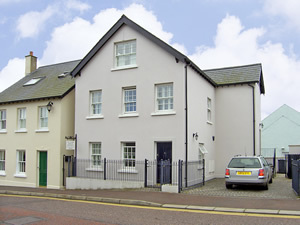 This beautiful apartment located in a small development is in a perfect location only a stroll from Ballycastle's famous Blue Flag sands. The apartments are finished to a modern high standard inside with all mod cons available and walking distance to the marina, shops, pubs, tennis courts and golf club. The lounge/ living area opens out through French Doors onto a patio area. A short drive will bring you to all the sights that make the Antrim coast world-renowned e.g.Carrick-a-Rede Rope Bridge, the Bushmills Whiskey Distillery and the Giant's Causeway.Shop. Pub. Restaurant. Beach 352 yards. GF: lounge/kitchen/diner. FF: double with ensuite shower room, twin, bathroom.Electricity and gas central heating included, linen and towels included, travel cot, high chair, TV, sky, dvd player, freezer, microwave, dishwasher, w/machine, patio area, patio furniture, off road parking. Sorry no pets.